Contingent99 has released a new trailer for its debut project, Wizard of Legend. 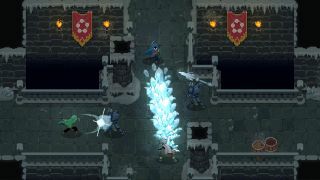 A "fast-paced dungeon crawler with an emphasis on dynamic magical combat", Wizard of Legend promises "quick movement and even quicker use of spells" that can be chained together to devastate enemies. It's also packed with over 100 unique elemental spells, procedurally-generated levels, dynamic bosses and enemies, and "endless" customisation options, plus couch co-op, too. "We knew we wanted create a game similar to the beloved action adventure games of the classic SNES-era, that emphasized item discovery and exploration," explains the team. "But we also wanted to create a game with an engaging combat system with a pacing similar to modern hack and slash games with a hint of inspiration from fighting games. What we ended up with is a fast-paced spell-slinging dungeon crawler called Wizard of Legend." As yet there's no confirmed release date, but a recent update on the Kickstarter page suggests the game will be available in early 2018. "It's been a couple of busy months since our last update and we've been fine tuning and polishing pretty much everything in the game to get ready for release," reads the statement. "At this point it seems most likely that we'll be releasing sometime in the early months of 2018. This is mainly because we'll need to work out a few extra details even after completing our work on the game. We can't thank you all enough for your support and patience with us thus far and we hope to have some exciting news in the coming few weeks that we'll most certainly post an update on, so stay tuned!" For more, head on over to the official site, or stake out the game's Steam page.